It’s been three months since Eddie Cutrer first entered the doors of Milestone Church. Since then Eddie has experienced a radical life transformation that has affected his entire family. “Prior to accepting Jesus into my heart and really committing my life to Christ, my life was a real mess. I had been in a failed marriage that ended in divorce and although I never considered myself an alcoholic, I look back now and realize that I was covering up my guilt and depression with alcohol. I fell into a deep depression and the drinking became even worse. My life needed to change. My wife Mindy and I were invited to Milestone on the second week of the Restart series (February 12) and we knew that God had placed us there. Everything that day just spoke to my heart and I knew at the end of the service that I was ready to ask Jesus into my heart. Since his very first visit to Milestone, Eddie has been passionate about taking next steps and getting involved. He and his wife, Mindy, have completed the Growth Track by attending Discovery 101, Dream Team 201, and Values 301. They volunteered during Easter Eggstravaganza and Serve Day, and Eddie has started serving on our weekend usher team. Two weeks ago, on April 23, Eddie and Mindy hosted a Discovery 101 table for the first time. Eddie has been involved with a men’s small group and is also hosting a middle school small group at his house for his daughter Ella. 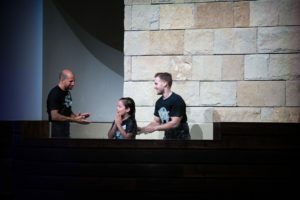 This past Sunday, Eddie and his younger daughter Evyn, decided to take a huge step together and be baptized. The transformation that has happened in Eddie’s life and family is a perfect example of what Reaching People, Building Lives looks like. God’s desire is that the local church would be a place where people can encounter hope, find spiritual family, and experience life change. Thanks, Eddie, for sharing your story with us! Jesus can and wants to transform our heart! Wow love this testimony- love how God changes the desires of our heart to align with his. What a great story! I met this family at Sam’s after SERVE DAY because we were all wearing our red shirts. : ) Serving with them now on Growth Track team and look forward to getting to know them better! Transformation begins and will always continue with simple steps of obedience. Just keep going and you will be blown away with how God reveals Himself and uses us to impact others. Eddie’s story is exactly that. So proud of you, Eddie! Love you brother….I’m so proud of you and happy for you!! Eddie is my son. I am sure their is no doubt how proud I am of him and his Family. His GrandMother prayed for his Salvation everyday. She has gone to be with our Heavenly Father. A Prayer has been answered. The Angels of Heaven are Singing. Thank You Milestone for welcoming and encouraging Eddie and his Family. Such a great story! Love Eddie and his family and how they’re all going after Jesus and serving in the church. 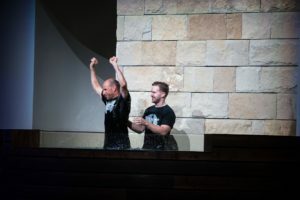 What an awesome story of redemption through Christ! So happy for this family that will forever be changed by a father’s willingness to open his heart to the Lord.